!2017 – Major General Oyite Ojok Demise 1983. David Oyite Ojok (15 April 1940 – 2 December 1983) was a Ugandan military commander who held one of the leadership positions in the coalition between Uganda National Liberation Army and Tanzania People’s Defence Force which removed strongman Idi Amin in 1979 and, until his death in a helicopter crash, served as the national army chief of staff with the rank of Major General. He was in exile in Tanzania in the 1970s, yet his tribe, the Langi knew for certain that David Oyite Ojok was a great soldier who would return from exile and crush the then ruling monstrous dictator Iddi Amin Dada; and so they said to Amin in a Luo song. “Dada ka pwod ru ineko Oyite Ojok ibino neon can….,” meaning “Dada as long as you have not yet killed Oyite Ojok, your demise looms large”. They sang that song all the time throughout Amin’s rule, at evening drinks & bars, marriage parties, funeral rites etc. David Oyite Ojok was born 15th April 1940 in Loro, Oyam District Lango Sub-region. He joined the army in 1963 and rose through ranks and by 1971 when Amin took power he was a Major and had just been promoted to a newly created post of Assistant Military Secretary in the Ministry of Defense. According to people who worked with him, Oyite was jolly, social and liked to be part of the crowd. He was also loved by his soldiers. When Obote fled to Tanzania in 1971, Oyite and many other soldiers and politicians loyal to him followed him. In the next 8 years, they would go through a long struggle and fight to return to power and finally defeating Iddi Amin in 1979. During the war, Oyite Ojok commanded the main rebel front UNLA (Uganda National Liberation Army) that fought alongside the Tanzanian Army to uproot Amin’s regime. And on 11th April 1979 when they victoriously marched onto Kampala, Oyite went to Radio Uganda and made the famous take-over announcement saying, “…the fascist regime of Idi Amin is no longer in power.” It is also interesting to note that late President Obote wrote in 1990 that when Amin’s regime was falling, Museveni wanted so much to be the one to issue the announcement of the take-over. And when Oyite-Ojok made the broadcast, he was annoyed. 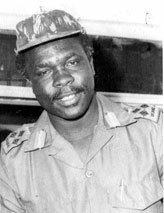 When a military council was formed to govern the post Amin Uganda, Oyite Ojok became the Army Chief of Staff. He was also a member of the Military Council that governed the country during the transition period together with Paulo Muwanga, Yoweri Museveni, and Tito Okello. During the swearing-in ceremony of the interim President Yusufu Lule at Uganda Parliament in Kampala, Oyite-Ojok, dressed in battle fatigues and wearing a steel helmet, was introduced as the new Army Chief of Staff. Soon after, a large crowd of jubilant Ugandans lifted Oyite-Ojok shoulder-high, marched through the streets of Kampala and paraded the new Chief of Staff, the war hero. When the liberation forces reached Oyite Ojok’s home town of Lira in Lango, a huge crowd again lifted him shoulder-high. During the transition period between 1979 and 1980 Oyite remained loyal to Obote who at that time was preparing to return to Uganda. Consequently he prevented all attempts brought up to frustrate Obote’s return to Uganda most noticeably by the interim leaders Lule and Binaisa. In 1980 elections were held and Milton Obote was announced the winner while other candidates like Museveni cried foul and took to the bush. It is Obote II regime that would demonstrate Oyite’s military and political strength. This was a delicate period in Uganda and yet peace and security of Ugandans rested in his hands and skills. WHAT DID OYITE DO IN OBOTE II? Kampala insecurity: The immediate problem Oyite was faced with as the army Chief of Staff was the widespread insecurity in Kampala at that time where most of the blame fell on errant UNLA soldiers. There were robberies, lootings and killings of civilians. Even though Oyite Ojok was known to be tough on indiscipline soldiers, motivating poorly paid battle ridden soldiers was a tall order. The complex situation finally proved overwhelming and dangerous and sadly claiming his life. The following BBC interview of Oyite Ojok was conducted by Jeremy Paxman in 1981. Jeremy Paxman: Really why all the gunshots and death around Kampala almost on a daily basis? Oyite Ojok: There are a few bandits who are giving us well… a bit of difficult time. Jeremy Paxman: Surely Brigadier, if these were just a few bandits why would you have road blocks all over the place? Oyite Ojok: I told you that these bandits are robbing guns with guns! Robbing people with guns! Jeremy Paxman: We saw a soldier robbing a civilian’s bicycle and another robbing money from a woman. Now these may be isolated cases but there are complaints everywhere of soldiers not only robbing people but killing some and this reflects badly on the image of the army, does it not? Oyite Ojok: That depends how you want to put it. If your business is going around looking for which soldier is robbing whose bicycle, may be you will find a soldier robbing a train! Jeremy Paxman: But these are issues that should concern you? Oyite Ojok: Sure! You show me which soldier is doing whatever wrong thing and I will take a severe disciplinary action against that soldier. Paxman: Have you actually taken such actions? Oyite Ojok: Absolutely, the jail is full. HONEST AND RESPECT: Many former soldiers narrate how the army commander in Obote II, General Tito Okello was always at peace with the Chief of Staff Major General Oyite Ojok. It is said that whenever General Tito Okello summoned Oyite-Ojok for a discussion, he responded and accorded Tito Okello maximum respect. This always got Tito admiring how lovely a soldier Oyite was. THE SUDDEN DEATH: 3rd December 1983 was a sad day indeed! When Oyite perished in that helicopter crush, many did not want to believe and let go the man they held as the pillar of Obote II government. Many historians say that there is no other leader in the history of Uganda whose death has been deeply mourned like that of Major General David Oyite Ojok. Many people in Northern Uganda where Oyite Ojok came from reported strange experiences they claimed were as a result of the sudden death. For instance, that day some people in Lango said that the sky did not look normal! Others said that they saw Oyite Ojok in the clouds, and more said that they saw red clouds. Meanwhile in Buganda the exact opposite was true: That day people brought out drums, balafons, and all sorts of musical instruments and celebrated! Most of them were heard saying that with the death of Oyite Ojok, their arch enemy President Obote would not last longer.